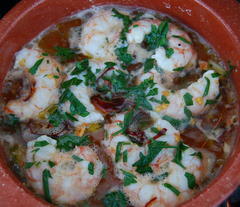 If you're looking for a Shrimp Recipe that typifies the south of Spain you must try this one. It's easy to prepare and quick to make. The flavors depend on the quality of the Ingredients. Extra virgin olive oil, Chillis, garlic, lemon juice and flat leaf parsley. Sounds simple to you? It is! Just put all the ingredients together and cook. It's ready in ten minutes and you will remember a really good one Forever. These quantities as a Starter - Double up for a Main Course. 2lbs. Fresh Shrimp - Prawns - the best you can get. 2 Dried red chillis - broken up. This is about as easy as it comes. Shell the shrimp and divide them between four 6" individual cazuelas. Now - A good glug of the oil in each dish. Pop the dishes in the oven and leave for 10 - 15 Minutes until bubbling fiercely. Put the hot dishes onto 4 Dinner plates and serve immediately. Have a few sips of chilled wine while they cool down a little and then attack using the bread to sop up the sauce.